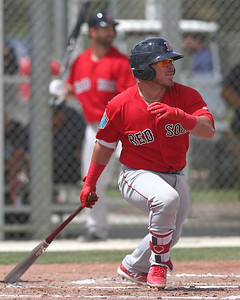 This continues our weekly roundups of the Fall and Winter Leagues, highlighting performances from players in the Red Sox organization. Coverage will continue every Monday into January. For the full list of Red Sox prospects participating in these leagues, check out our Fall & Winter Leagues page, which will be updated continuously through January. This week's roundup covers the period of November 5 - November 11. Josh Taylor continued to perform well, getting in two clean frames, one each across two appearances on Monday and Friday. Taylor has done a good job limiting his walks, with just two in 12 1/3 frames. Esteban Quiroz (pictured) had arguably the best offensive performance of the week, a 3-for-4 day on Wednesday with an RBI double. He was 4 for 9 on this week after working three walks on Saturday. Mike Shawaryn started on Saturday and allowed only a walk in two no-hit innings after he surrendered a run in a one-frame relief stint on two hits. He also had a walk and a strikeout mixed in. After pitching 149 1/3 innings during the regular season as a starter, he has been featured as a reliever this fall. With a hit in each of his final two games on the week, Josh Ockimey was 2 for 9, but he was still able to make an impact. He hit a home run on Wednesday and followed it up with another extra-base hit on Saturday, grabbing a pair of RBI in both games. He also had two walks on Saturday. Enmanuel De Jesus was not as successful as he was last week, but he did not allow a run in his two appearances, totaling just 1/3 of an inning. He faced one batter and allowed a hit on Thursday and gave up two more base knocks on Sunday, also recording a strikeout. Deiner Lopez was 1 for 6 and scored two runs across three appearances. Cole Sturgeon played in six games this week, breaking a five-game hitting streak with an 0 for 5 on Sunday. He had a double and a triple during the streak with four RBI. Oddanier Mosqueda allowed an unearned run on a hit and two walks in his only appearance, a 2/3-inning stint on Monday. Juan Hernandez was 2 for 11 in four games this week as well. Headlining a light week was Chris Madera, who was 0 for 2 and also stole a base in his pinch-running appearance, while Jhon Nunez was 1 for 6 across two games. The team returned to full-time action this week, going 3-2 in five games to increase its record to 9-4-1. Christopher Acosta allowed four runs, three of which were earned, in three innings on Monday, while the following day, Pedro Castellanos, Carlos Tovar and Leonel Jiminez each had two hits in a victory. The bullpen featured on Thursday, with Beiker Pineda and Jose Bens each delivering a pair of shutout innings and Gregory Segovia finishing it off with two strikeouts for the save. Carlos Tovar had two of the squad's five hits on Friday and after Jose Rosillo's three no-hit innings with two strikeouts and a walk, the wheels fell off. Each pitcher that followed gave up at least two runs, with Luis Colmanares allowing four without recording an out. Acosta pitched four shutout innings on Saturday to finish off the week and Victor Garcia, Eddy Rosario and Bens each recording two strikeouts in a clean inning of work. Ronaldo Pulgar, Gabriel Perez and Castellanos, playing right field, each recorded a pair of hits in an 8-1 victory, breaking out for four runs in the first.